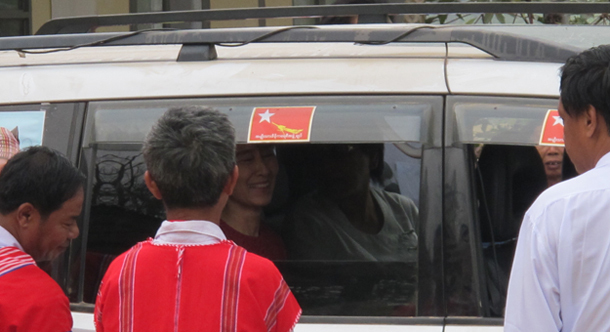 I jumped into an old cab and noticed a picture of Aung San Suu Kyi and two small flags of her National League for Democracy (NLD) party on the driver’s dashboard. When I said, “You have many of those NLD flags,” the driver pulled out two more party emblems with Suu Kyi’s photo from his pocket while still holding the steering-wheel with his right hand. The slogan read “NLD for the People.” The driver then started telling me how many emblems, flags and logos of Suu Kyi and her party he had collected for himself and his wife at home. “My wife has a purse with this logo too,” Zaw Moe Khaing, in his late 30s, said enthusiastically. 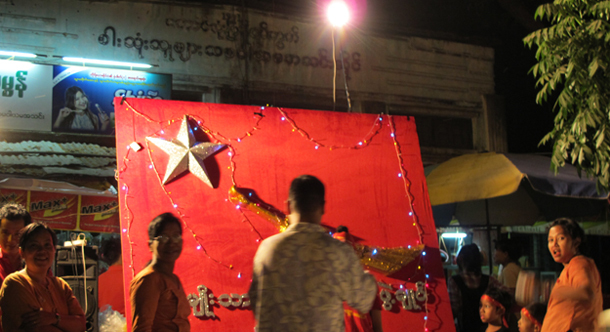 It was March 30, two days before Burma’s historic by-elections. Our taxi slowed to snail’s pace due to thick traffic when it reached Rangoon’s Mingalar Taung Nyunt Township. “It is because of NLD campaign activity ahead,” Zaw Moe Khaing explained looking at me through his rear-view mirror. Minutes later, we saw a huge crowd with signboards of Suu Kyi’s party by the roadside. 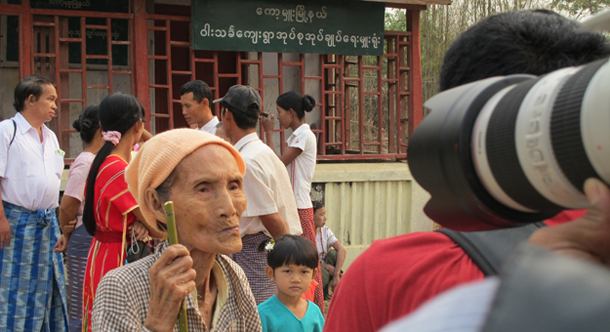 “I want to be the first to cast my vote for Daw Phyu Phyu Thin [the NLD candidate for the township],” said the driver anxiously. He added that he had bought one traditional Burmese shirt and longyi (sarong) to wear on election day. On March 31, soon after our car turned onto a road heading to Kawhmu Township, we encountered several types of vehicles from motorcycles to old improvised wagons also heading to Wah Thin Kha Village, where Suu Kyi would sleep overnight before visiting polling stations. 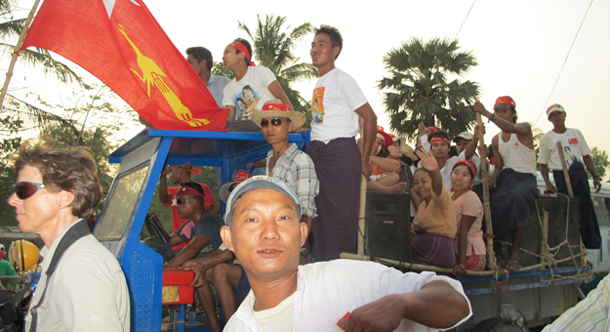 Young and old alike were on vehicles wearing T-shirts with pictures of Suu Kyi or the NLD flag. Most were wearing red headscarfs and some put small party stickers on their cheeks. 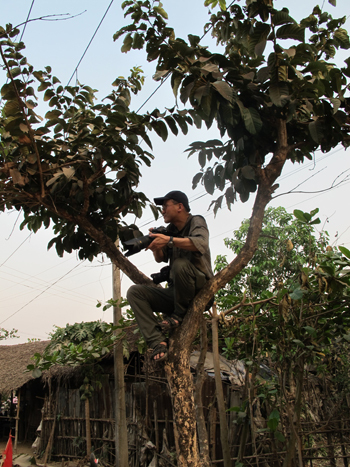 This guy suddenly jumped out of the vehicle and greeted me while I was taking pictures, “Brother, how long have you been here?” he asked, adding that he regularly watched programs by The Irrawaddy broadcast through Democratic Voice of Burma. 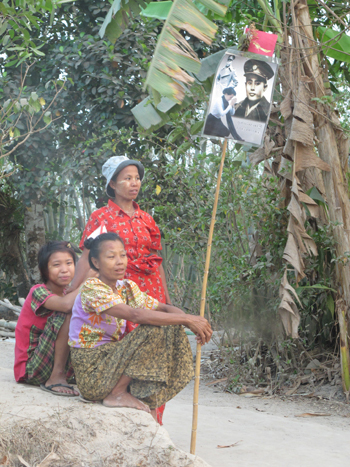 More viewers also greeted me when I arrived at Wah Thin Kha Village that night. At the junction to Wah Thin Kha Village, many foreign and local journalists took pictures of the crowds of Suu Kyi supporters as her motorcade passed by the dirt road en route to the village. One Japanese photographer climbed a tree to take pictures of people and vehicles following the 66-year-old’s motorcade. 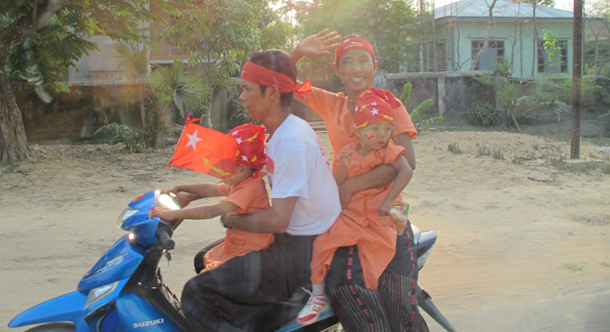 On the way to the village, some families were waiting to wave at passing cars with pictures of Suu Kyi and her father, Burmese independence hero Aung San, or flags of the NLD. Kids shouted “Mother Suu! Mother Suu!” with joy whenever a vehicle passed. Some villagers said that the eve of the by-election was more crowded than any festival Wah Thin Kha village had ever seen. Suu Kyi stayed at her house while hundreds of journalists and NLD supporters slept in their vehicles or at the monastery, while some local people allowed guests to stay at their homes. On the morning of April 1, local and foreign journalists were waiting to take pictures of Suu Kyi emerging from her house in Wah Thin Kha. 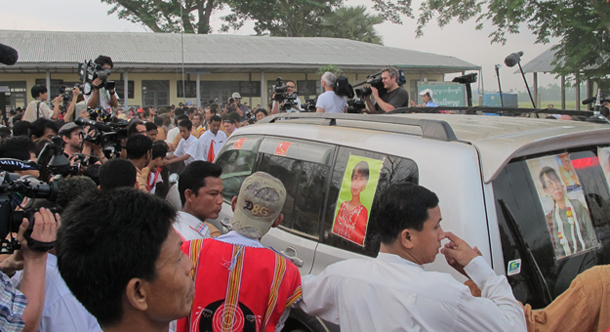 When Suu Kyi’s car left for the polling station at the village’s sole elementary school only a couple of hundred meters away, a jubilant mob followed her vehicle with cameras.